Ok I decided I will take the easy way out today with few other things coming my way. Meaning the post that I wanted to do today is not yet ready and instead I thought I will share this quick meal, rather a tiffin if you consider for an adult. But this I sent to my daughter’s lunch. So I take the liberty to tag it as 30 min meal too. Heat a non stick pan with oil and sauté onions well along with green chilies and roasted peanuts. Add finely chopped vegetables, salt and cover with a lid for 5 mins. Remove the lid and sauté again. When the vegetables are almost done, remove from heat, add the beaten rice and mix well. Since the beaten rice is very thin, it need not be cooked or soaked. When you are using the thinner type, you got to ensure you don’t cook it. It gets soft with the heat that is already there in the cooked vegetables. Add your vegetable of choice. This really one of those dishes that can be adapted to our liking. Roasted Peanut gives such a wonderful crunchy taste to the entire dish. Sending this to Mina who is hosting Kid’s Delight, themed on Healthy Vegetarian and Colourful recipe using fruit and vegetable. This makes a quick breakfast too. I have always used the thick variety. Yours with thin type looks equally good. Wat a filling,delicious and quick breakfast, simply inviting..
A healthy, nutritious and tasty meal! this is a hit rec. in our house too…light.lowcal.simple.quick. A healthy and filling breakfast..love this anythime..looks so good! Quick, healthy and colorful fix for lunch. I make this often too. Not just for breakfast but for evening snack. quick and easy – nice !!! Definitely the perfect breakfast.And yes can be consumed at any time of the day,esp on a tight schedule one. First time here.Now on to the other blogs of yours. 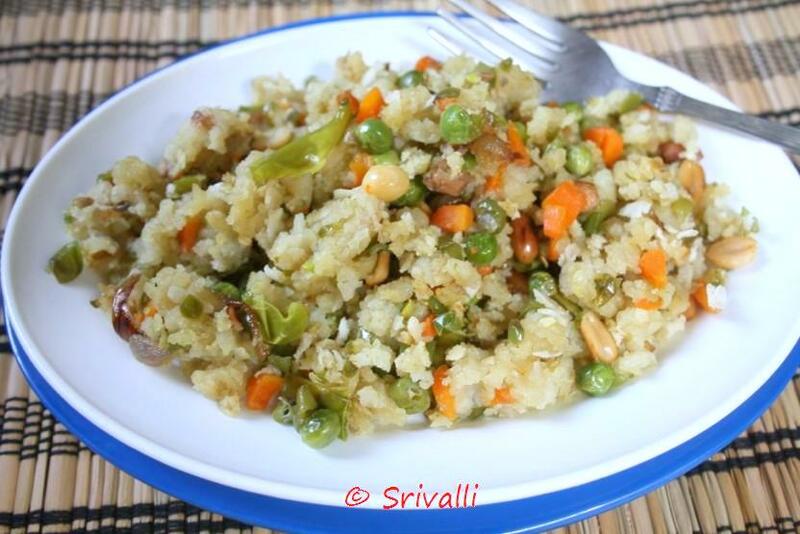 simple n light!…I would prefer a light vegetable poha anytime of the day! Healthy recipe..this is our breakfast once a week :)..Thanx for visiting my blog and for the comments. Quick,healthy and yummy breakfast…looks so delicious. Thanks for stopping at my space and for your encouraging comment..
Lovely meal choice. Very colorful and kids love it. I bet your daughter did as well. I like it better as a snack along with a cup of tea. What a lovely combination!! Looks delicious. healthy and easy poha !! That's one quick poha you have there Valli. I've to see if my son likes it, if he does then I can make it for his lunch box too. A perfect one during time crunches. Yummy! We make it for breakfast and can be eatten for lunch or dinner, as it is quite filling… And addition of vegetables makes it a complete meal.